The Normans kept rabbits like other forms of livestock, as a source of food and fur. In most situations they would be encircled by walls or water, eventually this became common place across the UK with rabbit enclosures (or warrens) being introduced to each county, as well as many islands. Some rabbits inevitably escaped and soon became established in the wild as feral colonies, but even with the feral population growing, rabbits were kept as livestock in enclosures. In time rabbits provided work, and many full time “Warreners “were employed to look after and harvest rabbits and rabbits became a booming industry. 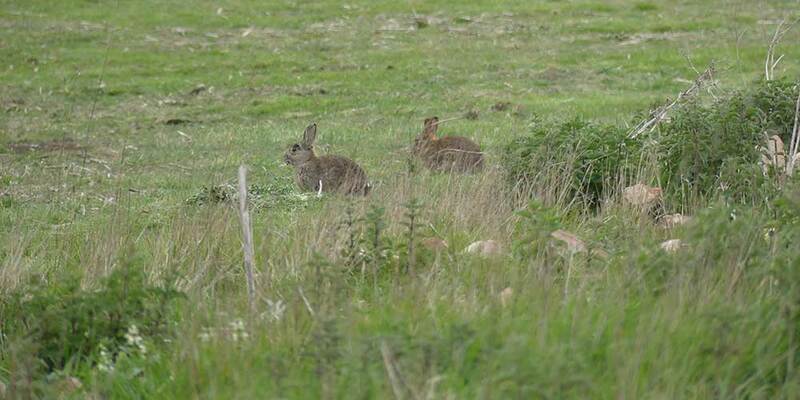 There are many records of several thousand rabbits caught in these locations especially in the Breckland area. Many of these rabbits would have been harvested via methods we employ today with the aid of traps, or ferrets and dogs. Eventually, to add to the rabbit’s value, they became a much loved sporting quarry, with many of the gentry hunting them. With the human population growing across the UK, and following the agricultural revolution, there was the inevitable conflict of interest with the now, very considerable rabbit population. A rabbit’s ability to breed and eat is second to few species, and by 1951 the rabbit population was estimated at 100 million. In the early 1950s with the introduction of the man made disease, myxomatosis caused the population to crash to a fragment of their former glory, in fact in excess of 95% of the rabbit population died out, but with time the few rabbits that were left, developed a degree of immunity to the virus and the population once again began to increase to the population we have today. The rabbit’s success has not been limited to the UK; in fact they have become an issue in many parts of the world including Australia and New Zealand. In 1859 Rabbits where introduced to Australia by an Englishman by the name of Thomas Austin from Somerset, for sport, particularly shooting. The population rapidly increased and has become a serious threat, not only to many native species through loss of habitat, but also to the huge livestock industry by devouring vast amounts of grazing. Many now deem the rabbit “cute but dangerous”. The problem became so severe that a rabbit fence was erected across the width of the country in a desperate attempt to stop the furry army. Captain Cook introduced the rabbit to New Zealand where there too they soon assumed plague proportions. Today the “Easter Bunny Hunt” often makes the headlines reminding us that it is not always a good idea for humans to introduce species to other countries. Various man-made diseases have been produced in an endeavour to control or even eradicate the rabbit; however, the biggest threat to them today is the Viral Haemorrhagic Disease and its variants. This naturally occurring virus has decimated rabbits in some areas, but from various reports it would appear that once again the ultimate survivor, the rabbit is fighting back! The rabbit may be one of the world’s top ten most invasive and destructive species, but whatever your personal views are on the rabbit you can’t help but respect them for their ability to thrive despite everything they have thrown at them! How we use the rabbits we catch?